Join us at Soft Touch Arts for a Show + Tell evening. Learn more about our award winning charity through a series of testimonials from young people who have taken part in our mentoring and creative enterprise programmes. Throughout the evening, we will be celebrating their achievements with presentations about the work we do, two live interviews involving young people, and a short certificate presentation. Stalls will be set up around the venue where you will be able to find out how you can support Soft Touch Arts by becoming a mentor or commissioning artwork by our young people for your workplace. 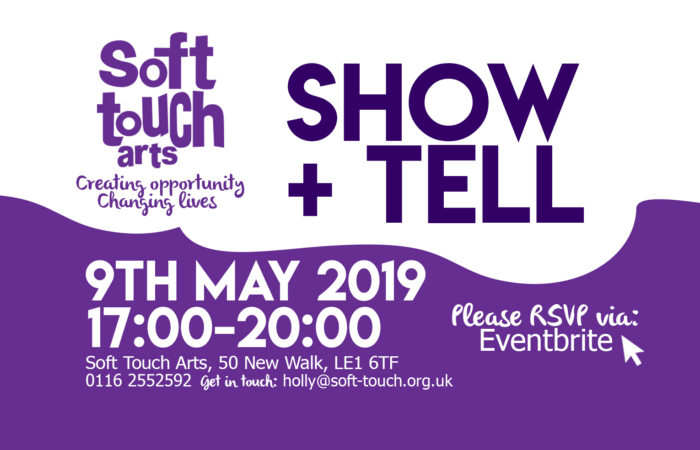 The evening will be a great networking opportunity for local businesses and a perfect way to connect with those who have contributed towards and benefited from the charitable that work Soft Touch Arts delivers across Leicestershire. Please RSVP via Eventbrite, and remember to opt in to our new Show + Tell mailing list to hear about similar events in the future.